JOHN CRUWYS was the son of another John Cruwys, and the fourth successive generation bearing that name, all of them at one time lords of the manor of Cruwys Morchard. He could trace his ancestry back to Richard Cruwys, the earliest of the family known to hold the manor, shortly before 1200. His mother was Alice Ayshford, of Burlescombe in East Devon. 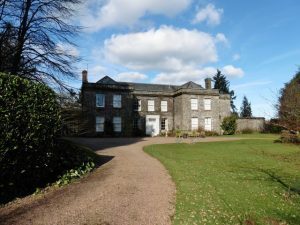 The road from Tiverton to Witheridge runs along high ground past the northern boundary wall of the manor house grounds. A little to the south of this road lies the church of the Holy Cross (Cruwys means ‘cross’). Cruwys Morchard House stands alongside it. The present house is mostly Georgian, preserving some Tudor features. John would have lived in the older Norman house, with its ten-foot thick walls. There is no village of Cruwys Morchard. The nearest settlements in the parish are the hamlets of Pennymoor, Way Village and Nomansland. ANNE KEYNES had a similar parentage. Her father was Humphrey Keynes, lord of the manor of Winkleigh. The town was then known as Winkleigh Keynes and was the administrative centre of the Winkleigh Hundred. It is likely that John and Anne were married around the 1540s, in the closing years of the reign of Henry VIII. They had a large family. John’s will names Arthur, Robert, James, John and a daughter Johan. Anne’s will adds Humfrye, Anne, (? )Marye and Ellynor. There was also a son Thomas. There may have been others who died in infancy. These were the turbulent years when England was switching between Protestant and Catholic monarchs, with Henry’s children, Edward VI and Mary I. The Protestant Elizabeth I inherited the throne from her Catholic sister Mary in 1558. One, at least, of John and Anne’s daughters suffered for her Dissenting sympathies in adult life, and this may be the result of upbringing in a strongly Protestant family. John’s father, John Cruwys senior, died in January 1559. Since his older brother Thomas was already dead, John now inherited the manor. He was in his late thirties and held it for eighteen years. He was an armiger, one entitled to bear a coat of arms. The Cruwys arms were: Azure, a bend per bend indented argent and gules between six escallops or. This means that the shield was divided diagonally by adjacent bands of silver and red, with saw-toothed edges. The ground on either side was blue, with three gold scallop shells in each section. The crest above was a helmet, surrounded by draperies or foliage. It was probably soon after this that their daughter Ellynor, married Robert Southcombe of Mariansleigh. The 1569 Muster Roll lists John Crewse, a landholder, in Cruwys Morchard, specially charged with providing arms. There was another John Crewse in nearby Rackenford, probably a cousin. In 1570, their eldest son, Humphrey, married Dorothy Hatch of Aller. Her stepfather paid for the wedding clothes for the pair, for the reception, and for the accommodation of their friends. John’s contribution was a substantial marriage settlement for Dorothy. He granted her an annuity of £20, issuing out of a tenement in Throwleigh called Norden; in Cruwys Morchard one close of land called the Gratton; one close called the Verley; the close called the Horsepoole close; one meadow called Horsepoole Meade; one close called Batelees; one close called Oxenpoole; one meadow called Batelees Meade; one parcel of land called Southmore; one meadow called Rackenford Meade; one parcel of land called Ham Morchard Woode. Since Dorothy survived her husband by 34 years and her son by fourteen, she had plenty of time to benefit from this annuity. John made his will from his sickbed on 18 February 1577, almost certainly in the knowledge that he had not long to live. He left 20s to the poor of Morchard and 10s for church repairs. His son Arthur received a feather bed and a feather bolster, his son Robert another featherbed and his best gold ring which he used as his seal, while his sons James and John got a featherbed each. Johan was to have £50 when she married. We may presume that the other girls were already married and had received dowries then. All the rest of his movable and immovable goods, after payment of debts, went to his wife Anne, whom he made his executrix. John died about two months later, in April. He was aged about 56. The will was proved in Canterbury on 4 May 1577. 1577 Crewes, John Esqr. 19 Apr. Anne survived him by nine years. Both were charged for an annual income from land, but Anna’s obligation is higher than that of her eldest son. This probably reflects the land John left her. Like her daughter-in-law Dorothy Hatch, she may also have had a substantial marriage settlement. Humphrey, now lord of the manor, is listed as an armiger, having the right to bear a coat-of-arms like his father. Some, at least, of the Keynes family were Catholics who did not accept the Reformation. In 1582, when Elizabeth I was on the throne and the threat from Spain was hardening her previously tolerant attitude to Catholics, the Keynes family were caught up in the new hardline measures. In 1581, 1585, 1593 drastic penal laws were enacted against Catholics. Over 200 were executed as traitors. There were heavy fines for saying or hearing mass. In 1581 fines for not attending Anglican service were raised massively from 1s a Sunday to £20 a month. Two of the Keynes family, Humfrey and Edward, were arrested and sent to the Clink Prison on the South Bank of the Thames. They may well have been Anne’s brothers. We know from their father’s IPM that her eldest brother John was not the only son. Sometime between 1581 and 1586 Anne moved to Moretonhampstead. Her connection with the town is not clear. Since she made her daughter Joane her residuary legatee and executrix, it is possible that the two were living together. In her will she asks her son Arthur to continue to support Joane and the servants in her house for the next three months, so he may have been living in the area, too. Joane appears to have remained unmarried, which means that she never qualified for the £50 legacy her father left her. ‘Mistress Joan Cruwys’, who was Anne’s daughter, executrix and residuary legatee, is named again in the court records of 1610 and 1613, in the reign of James I. She was summoned to appear at the Devon Quarter Sessions to take the oath of allegiance. True to the Catholic tradition of her mother’s family, this she refused to do, and was committed to Exeter Gaol. She had not attended her parish church for two months. Non-attenders were presented by the parish constable, who was entitled to a reward of 40 shillings for every person convicted of ‘recusancy’. An act requiring this show of allegiance to the Protestant faith was passed in the third year of James’s reign, as a direct result of the Gunpowder Plot of 1605. The plot had been intended to kill the king, the royal family and Parliament, and to replace them with a Catholic monarch. Recusants were more usually Roman Catholics, but they could also be Dissenters. In the next generation, the Cruwys family were Parliamentarians in the Civil War, and related by marriage to Hugh Peters, Oliver Cromwell’s chaplain. They were therefore likely to sympathise with the Puritan movement. The Keynes family were staunch Catholics, and Joan is most likely to have been one of them, but it is just possible that the Puritan streak in her father’s family meant that she was a Dissenter. Later that century, Moretonhampstead was a stronghold on the side of Parliament and it had some of the earliest Dissenting chapels in Devon. Joan also paid a massive fine of £60 for recusancy. The Keynes family was further impoverished by the profligacy of Humphrey Cruwys of Cruwys Morchard, grandson of Humphrey and Mary Keynes by their daughter Anne. He ran up a stupendous debt of £2000. In 1559, his parents John and Anne Cruwys and his uncle John Keynes arranged a loan for him on the security of their estates. One of the four who provided the loan was Thomas Broughton of Stoodleigh, who took over the Keynes lands in Winkleigh after the sale to George Escott. A Cruwys Morchard Notebook. 1066-1874. M.C.S. Cruwys, Records at Cruwys Morchard. Trans. Dev. Assocn. Vol. 84. 1954, 1-19. Full text of “Publications of the Catholic Record Society”, Google Books. PCC Will, Prob 11/69, 1586 Cruse.